Irish women athletes made history at these Olympic Games. Not only did Katie Taylor win Gold but more women qualified and competed than ever before, and for the first time about half of the Irish team were women. Team Ireland made it the best Olympic Games since Melbourne in 1956 and many in the team credit Chef de Mission Sonia O’Sullivan, Olympic medal-winner, as the reason for the unique spirit of the group. In the weeks running up to the Games Athena Media produced a series profiling some of the women athletes and their stories for Newstalk Breakfast, and in this one hour documentary producers Helen Shaw and Lisa Essuman talk to athletes including Annalise Murphy, Olive Loughnane, Natalya Coyle, Chloe Magee, Lisa Kearney, Aileen Morrison and Sycerika McMahon as well as team leader Sonia O’Sullivan about the behind the scenes stories of the Olympic Games, the highs and the lows, winners and losers, and the lessons from London 2012 for the future of sport in Ireland. The documentary was broadcast on Bank Holiday Monday, 29th October 2012 at 12pm on Newstalk 106-108fm. An Athena Media production for Newstalk supported by the Broadcasting Authority of Ireland. Listen to London 2012: Winning Women after the Games, Part 1 and Part 2. 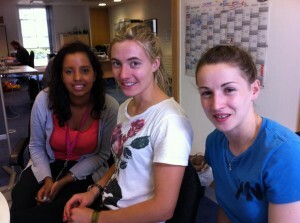 Listen to a promo for London 2012: Winning Women after the Games here. Listen to a second promo here. Subscribe to our Podcasts on the Athena Media RSS Feed here.